The success of any organization is, without doubt, contingent on the productivity of its employees. With employers optimizing their human capital through costly investments in recruitment and training, new statistics on employee retention may have them worried. According to U.S. Department of Labor, American workers, in increasing numbers, are quitting their current jobs to seek out better employment. A staggering 3.56 million people left their positions in the month of May, causing a basis for employer concern as lower employee retention can adversely impact all parts of an organization. Companies will be forced to expend their resources on replacing lost employees, and the overall rate of company productivity will decrease as a result of a transient and unsatisfied workforce. 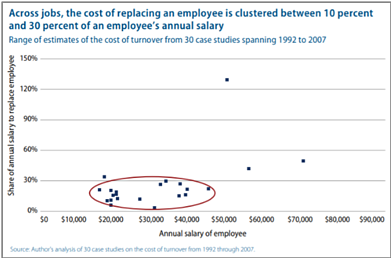 Replacing an employee comes at an extremely high cost for the organization when considering the cumulative costs of off-boarding, hiring, and on-boarding. According to the Center for American Progress, the cost of replacing an employee is estimated to be around 20% of the position’s annual salary for mid-ranged roles and up to 213% for higher-skilled employees. Additionally, the transition itself poses as a detriment to productivity, as it could take a new hire up to 2 years to achieve the work capacity of a seasoned employee. In order to combat the trend, employee retention needs to be an active effort. That is, employee satisfaction can no longer be treated as an afterthought. A good place for an employer to invest may be in employee happiness and satisfaction. In addition to higher retention rates, a recent study reveals that happy workers are considerably more productive. In one experiment, researchers provided randomly-selected subjects with various influences intended to increase their happiness, confirmed that the given techniques were actually effective in doing so, and finally, monitored their performance against that of a control group. The result was a 12% higher productivity rate. Conversely, another experiment studied the effects of stressors, such as family illness and loss, on present productivity and found that lower happiness consistently yielded lower productivity. In conjunction with happiness, employee health also has a heavy influence on retention and the capabilities of the workplace. In an extensive study, employee health risks were shown to be directly correlated with lower productivity. The study explores the effects of specific health risks, including high stress, poor diet, physical inactivity, alcohol/tobacco use, and poor mental health, in relation to worker productivity as measured by the Work Limitation Questionnaire. The employees who reported more health risks were more inclined to report a high level of work limitations. Compared to low-risk individuals, those of medium and high-risk were shown to be 6.2% and 12.2% less productive, respectively. Additionally, employees with more health risks were also more likely to report job dissatisfaction, a leading indicator for retention. These concepts, if understood and pursued by employers, can act as a strong advantage to any business. Organizations should focus their efforts on creating a company culture that values and promotes employee wellness as part of a comprehensive strategy towards effective employee retention and productivity. Companies can start by launching an employee wellness program to educate and encourage healthy habits in an enjoyable and transparent way, creating a sense of community around wellness. A happy and healthy workforce serves as the foundation for lasting prosperity within an organization. Business leaders can start small by encouraging members of their organization to work toward better mental and physical health independently and eventually establish initiatives that promote health as a collective effort.